Product prices and availability are accurate as of 2019-03-22 04:33:34 EDT and are subject to change. Any price and availability information displayed on http://www.amazon.com/ at the time of purchase will apply to the purchase of this product. Have you been annoyed by the cluttered desk filled with different kinds of cables? Have you spent much time bending to search the cables under desk? Darller 40 pcs car cable clips can help to solve this problem easily. - Our car cable clips are made of envrionmentally friendly soft plastic, no harm to cable or wire. - 3M double-sided foam tape makes super sticky. Strong adhesive make it grip firmly, and lock a wire in place once closed. - Our car cable clips are lightweight and strong ABS engineering grade thermoplastic constraction. - These car cable clips peel and stick with 3M adhesive. Easily mount to a desk, wall, table and other flat surface, easily disassembled and without any residues. - Without punching a hole or attaching any screws to install these innovative adhesive cable clips can help you to organize all the small cable wires in place. 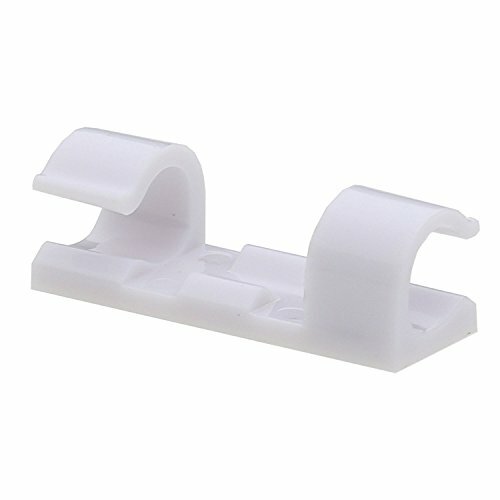 - Our car cable clips can be used for a wide variety of cables including computer / TV cables, USB cables and network cables, on any surface for home or office, such as a wall, wood, glass or others. 1. Initially clean the area with alcohol and allow drying naturally. 2. Peel off the sticker, paste them. 3. Attach to a smooth, clean surface such as glass, plastic. 4. Use your thumb to press them in for the first 5-7seconds. 5. Do not put any weight on them for a few minutes until the adhesive really sticks. 6. Put the cables into the clip and lock it in place. 7. Avoid move it frequently. GREAT MATERIAL - Our adhesive cable clips are made of envrionmentally friendly soft plastic, no harm to cable or wire. These cable clips peel and stick with 3M adhesive. Easily mount to a desk, wall, table and other flat surface, easily disassembled and without any residues. PRACTICAL & DURABLE - Gogogu adhesive wire clips are convenient, space-saving, and easy to use. They will work with any type of small diameter wires, as long as there is a smooth, clean surface to stick to. Fantastic solution for routing cables.It is handy and perfect for cable wire management! MULTIPLE USE - Our car cable wire holder can be used for a wide variety of cables including computer / TV cables, power cords, USB cables, and network cables, on any surface for home or office, such as a wall, plastic, wood, glass, metal, rubber or others. WAY TO USE - Clean the attachment surface before adhering the cord clips, tear off the gum, then line the cord into the clip with both hands, adhering the clip on the wall, the adhesive power may be weakened in cold weather. Highly suggest you to heat the adhesive pad at the bottom by blower or hot water bottle before use. RISK FREE GUARANTEED - Quality guarantee and 5-star customer service. If you are not 100% completely satisfied with your order, simply let us know and you will be offered a FULL refund or replacement.